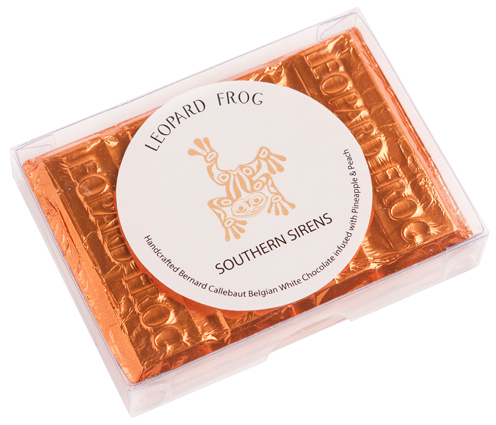 Southern Sirens combines Bernard Callebaut Belgian white chocolate with freshly squeezed pineapple and peach essences to deliver an alluring chocolate experience. Mouth-watering white chocolate with freshly squeezed pineapple and peach essences that deliver an alluring chocolate experience satisfying to the mind, body and soul. Chocolates comes from cocoa, which is a plant. Therefore, chocolate is a salad. Sugar, cocoa butter, dry whole milk, emulsifier (soya lecithin), pure pineapple and peach essence.